Organizing, Budgeting, and Saving are my buzz words for 2013. I have yet to prepare a long list of goals I want to accomplish this year. As I've said in my year-ender post, 2012 has been a challenging one for me. I have are lots of things that needs to be done this year for a more productive and stress-free day to day routine, both as a mom and an employee. Done! 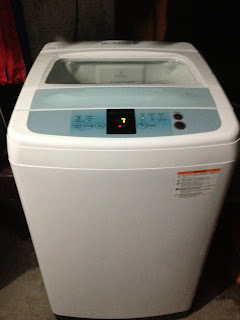 We already bought a Samsung automatic washing machine last Sunday. Whoa!such a relief for having a new laundry assistant. I'll see if I can post a product review about this soon. Home organizing has been my project since last year. Unfortunately, I've done it in a very small portion of our humble abode. Taking care of my activley growing 2 year old son do take a big chunk of my time. This month, I hope to finish de-cluttering the kitchen cupboards by getting rid of unneccesary things that piled up in there. At the office, I also started sorting the 2012 files and put them in my designated area in the storage room. Next in my to-do list, is labeling each of the folders for easy retrieval when needed. I have to organize the files in my desktop computer. There are files that needs to be deleted such the draft reports, drafts blog posts in MS Word (lolz), etc. etc. I have two ways in tracking my expenses. I have a small notebook wherein I list the details of income and expenses and I recently created a installed a free app called Spending in my iPhone which will enables me to record the summary of monthly income and expenses. My husband and I agreed to set aside x amount for our savings. Since each of the kids has piggy banks already, I want to make sure that we put our target amount weekly. In fact, I used the 52 Week Challenge I've seen on Facebook as a strategy for the kids 'saving. I will try my very best to keep up with it. Please wish me luck, guys. Linking up with 30 Day Blog Challenge. Organizing computer files has been on my list for a while now too. Here's to us achieving our 2013 goals! Good luck to our 2013 goals! I have to really work hard to stick with our plans re: savings.